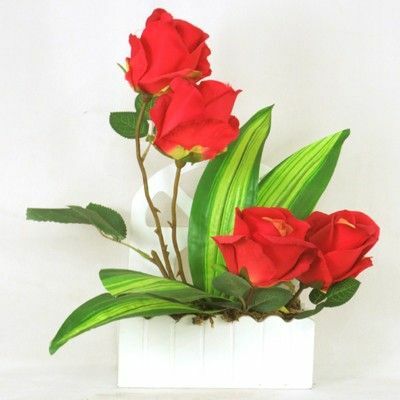 Arrangement of Silk Roses in Home Shaped Wooden Base. Free your house from those monotonous looking flowers vase by bringing in this silk red roses with green leafs to your home that stands out from the rest. Its elegant work with white wooden base makes it an eye catching product that would lift the mood of your house, wherever you might place it. Color : Red, White Material : Fabric, Wooden Base Product Dimensions (LxBxH) : 12"x4"x16"